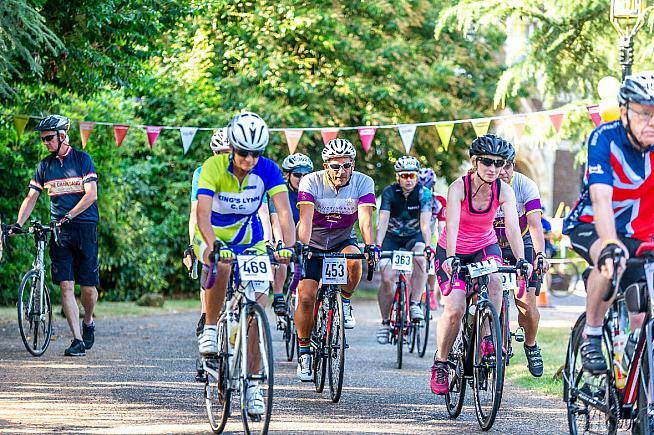 If you've ever had the desire to see what the countryside around Norfolk has to offer, but don't really have the time to spare, the Cycle Together Sandringham sportive could be the answer to your desires - and you can do some fundraising along the way to help everyone at Park House, the local Leonard Cheshire home. Leonard Cheshire homes were started by the former RAF Bomber Command pilot who became the RAF's youngest commanding officer, led the famous 617sqn (the "Dambusters"), and was also a leading figure in the development of the Pathfinder Force, being awarded the Victoria Cross in 1944. After the war Leonard Cheshire took a dying colleague who had nowhere to go into his home and nursed the man himself. This one act of kindness led to the formation of Leonard Cheshire homes that is at the forefront of supporting individuals across a range of disabilities to live as independently as they choose, opening doors to opportunity, choice and support in communities around the globe. With 7500 people working across the whole of the organisation, and the patronage of Her Majesty the Queen, every penny raised goes to help support all of these ventures. So that's the 'science' bit, what about the ride? 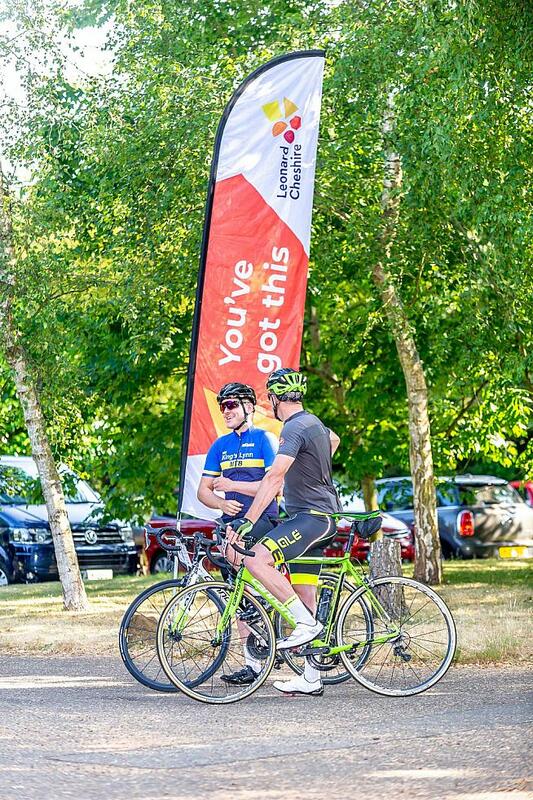 Leonard Cheshire's Park House is situated in the grounds of Sandringham Royal Estate and, as the name suggests, this is the starting point for the event. 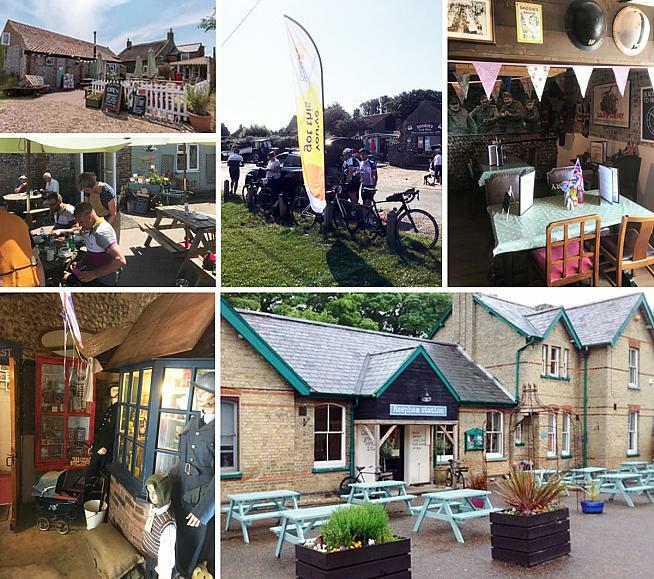 New, this year is the epic 150 mile route around Norfolk but for the less adventurous, more fun loving pedallers there are 100, 75, 50 and 25 mile routes, and even a very family-friendly 10 mile sortie. 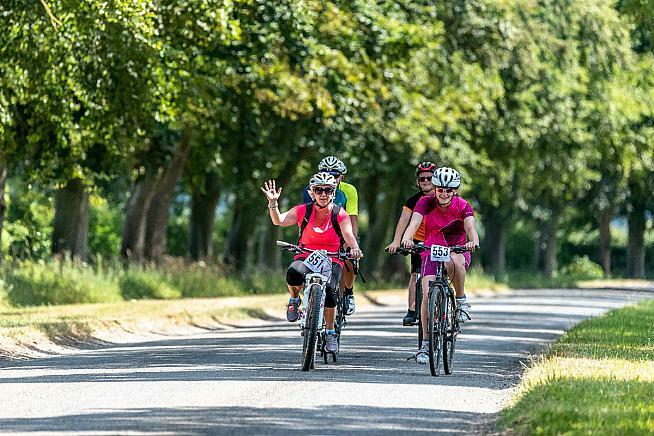 I opted for the 150 miler, the route to choose if you want maximum one-day exposure to the Norfolk countryside, which takes you along the North Norfolk coast and back via the famous Norfolk Broads. It was an early start, 0700, for the long-distance travellers. The weather was the right side of cool and, at that time, just under warm. Ideal. As the riders amassed for the brief I realised that I'd left my sunglasses in the car so that, post brief, I would have to dash to the car and catch up with the rest of the riders as soon as I could. The briefing was straightforward, reminding us that we were not on closed roads, to observe the Highway Code, keep safe and a quick look at the signs that would guide us throughout the day. For the first few miles it was a black arrow on a yellow background and after the route split we would be looking for a sign made up of a black chainring with a direction arrow in the centre. It was made clear that the signs weren't at every junction, so if we arrived at a junction and there was no sign available it's just straight on! How that would come to haunt me will become clear later on. After the small diversion to pick up my glasses it was a quick dash to catch up with the bunch of riders heading out for the day. Very quickly the pace settled and in short order there were two or three groups heading out on the quiet country roads. For quite a while it seemed like we were the only ones up at this time of the morning but as we rode through small hamlets and villages the aroma of bacon butties and full English breakfasts being cooked was assaulting our senses and adding to the ambience of the countryside. It seemed that in no time at all we were skirting along the desolate but stunning looking coastline - no kiss-me-quick hats or slot machine venues along this stretch - and arriving at the first feed station. The feed station arrangements were 'different' to those I normally experience on sportives. The organised feed stop was from the back of a van parked fairly adjacent to a café, Cookies Crab Shop. The van had loads of bottles of water, bags of crisps and Mars bars but 'mates rates' had been arranged with the cafés if anybody wanted anything stronger or more substantial. None of our group bothered with the substantial offer at this point. Bottles topped up and a chomp on a bag of crisps and we started on the next part of the scenic tour. Very quickly my new ride buddy, Matt, and I were part of a four-man group. The other two riders were members of the Sandringham and West Norfolk cyclists, an informal group of cycling enthusiasts - not a cycling club - who just get together for the joy of cycling, and as the 'local boys' they were worth sticking with. Unfortunately for Matt and me, the two SWN riders peeled off and left us to continue on our merry way. It wasn't too long after their departure that we made our first unintended detour from the route. After a set of roadworks we missed a turn point, without immediately realising it, and continued as briefed, 'if there's no sign just carry straight on'. In events like this a sort of sixth sense kicks in and you become unsure about whether you're on the right track or not. We'd come to that point. Our initial reaction was to go back along the road we'd just come down but then Matt, being local(ish), noticed the S30 cycle route which should give us a shorter run back on route.....not! The route was single track with blown sand covering the edges and cars coming the other way and vying for road space. Matt had run out of water, and it was getting hotter by the minute, so we were grateful when we spotted a couple of beach shops that sorted out the water issue. Eventually we got to the main road, phew, and set of in the direction we'd decided on. Before too long we saw our previous group of riders coming towards us so a quick 180 turn got us back onto the bunch and reassured us we were back on the right track. Ironically a couple of the guys had also missed the same turning point as Matt and I had. Fortunately we hadn't missed the second feed stop, so it was full steam ahead for stop number two. Feed station two was at Poppylands, a 1940s themed café. Our support van was there waiting again, but this time everyone opted for the more substantial offerings from Poppylands. Bacon butties, cakes, tea and coffee were the order of choice and made for a chatty stop amongst the riders discussing how a few others missed turning points, which makes you feel a little less stupid. Sitting in the warm sunshine having a brew and chat was all very idyllic but there was still a long way to go, about 80 miles, so a quick visit to the men's room and a visit to the support van to top up the fluids and it was time to be off once again. The wide open vistas of Norfolk really are something to see, and very soon Matt and I were trundling through coastal towns and villages that were just that, towns or villages. No amusement arcades, noisy parties or jingling slot machines, just the houses and coastline. For whatever reason the pair of us got separated and so I was out there pedalling away heading toward the Norfolk Broads boat hire epicentre known as Wroxham. I had previously visited the place back in the giddy days of being a young teenager but that wouldn't help me on this visit. After waiting with quite a queue of traffic I was up and over the humpback river bridge and on my way. After a few junctions the sixth sense thing kicked in again and I had the uncomfortable feeling that something was not right, which was confirmed when I hit a major A road and signs for the Norwich Park and Ride. Heading back into a close by village I stopped another cyclist, not on this sportive, who fortunately knew how to use his 'iPhone thing' and showed me a map and advised me to head back into Wroxham and see if that could help me retrace the route. Once back in the town I made some enquiries and discovered that when I was in the traffic jam, taking more notice of the traffic than anything else, I should have turned right instead of going straight on; so now I was back on track, phew. This was further confirmed when I met the guy driving the sweeper van collecting the direction signs as the last riders go through, an encounter that came as a bit of a surprise for both of us. He didn't reckon on me showing up because he'd been following what he thought were the last three riders, and then I pitch up. Thankfully he confirmed I was now heading in the right direction and, furthermore, replenished my dwindling water bottles. Great stuff I was on my way, again! Shortly after that meeting I caught up with the three riders he mentioned and they also looked surprised, but when I told them I'd missed the turning they just wished me luck as I carried on by. The raise in temperature was quite obvious by now but it was quite gratifying to see a couple of riders that were in the original starting group so many, many miles ago. I was pleased to see some friendly faces again and stuck with them whilst we ventured towards feed station three at the Old Railway Station at Reepham. As the three of us approached the area we couldn't see any signs for the café. One of the riders told us that his Garmin was telling us to turn right, but at that precise time another cyclist came from that direction and told us that the feed stop wasn't up there, but in fact was a mile away in the opposite direction, so off we went. After a mile or so we realised something wasn't right so we headed back to the original junction and then we saw the sign which, in fact, was pointing to the right, as Mr Garmin had suggested: he was right and we got there shortly after. As before the van was there with the 'freebies' and the station café was there for any other goodies. Time was now getting on so crisps and Mars bar were fine, plus a top up of water and very quickly it was time to move on, again. 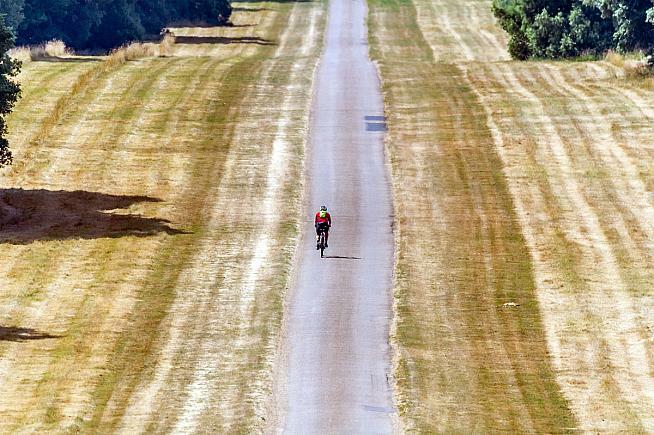 A small group departed Reepham and myself and another new cycling buddy ended up being a little further ahead and paced each other whilst having a bit of a general chat about life and the meaning of everything, and the fact that it was bloomin' hot. Throughout our chatter we discovered that we had a mutual friend, someone I worked with recently and someone he'd recently completed a London to Paris bike ride with. Small world, eh? A few miles along the way I heard him mention something about a glorious bit of shade, not sure what, but at the next junction I turned around and he'd gone, I was back on my lonesome. I was being very careful now that I paid extra attention to make sure I didn't miss any more direction signs; approaching the town of Holt was also approaching the 120 mile point: so, so near yet so far! Once in Holt there were no visible signs to follow and, before I knew where I was, I was on the outskirts of the road approaching the A148. This didn't seem right so I headed back into Holt, found the original direction sign and carried back into town. No more signs visible so I took a different turning but ended back at the A148, and feeling very frustrated. Third time lucky, perhaps. Back into Holt, which was now resembling a black hole, and with still no signs visible I started asking people on the street for directions towards the next town. Unfortunately every person I asked was a day visitor to the town and knew as much as me on how to get out of the centre. Eventually I came to the decision that with no real idea where I was and how I was going to get to where I needed to be I had just one choice, the A148! Admittedly under normal circumstances such a busy road would be one to avoid, but I wanted to get to the end of the ride, and the frustration, so the A148 it was. I wasn't on there long before I saw a sign telling me that Kings Lynn was 33 miles away, so I reckoned that Sandringham was about 28 miles further on, but I was only guessing. I'd be lying if I didn't admit to things getting a bit of a struggle at this point. It was an incredibly hot day, the angst and frustration of missing turns and getting lost and having to give up on the actual route was was annoying, but at least I had an idea of my general whereabouts so keep calm and pedal on! The traffic wasn't too bad so that was something of a comfort. Every time I saw a brown tourist information sign in the distance I was silently praying that it would be the turn off for Sandringham, but no, each time it was for some other touristy venue. Every incline became a slog to get up but every descent made for a quick rush of energy to get a little bit further along my improvised route. I was beginning to beg for the end to be in sight, and once the computer mileage had clicked over to 150 it went through my mind that I'd done the mileage so why don't I just jump in a taxi and get back to Sandringham. With that I turned a corner and there, parked outside a garage, was a taxi! But then I decided that's not the thing to do and carried on. Many more brown tourist information signs came and went, as did the ups and downs in the road, but now I'd got the low battery sign on my computer and the last bits of fluid in my bottle were very warm, yuk. I had to get more fluid, preferably cold, and as soon as the next garage appeared I was in. The old boy behind the counter was a little shocked when I downed a bottle of Lucozade before filling a bottle with some Ribena drink, he was even more shocked when I told him that my present mileage was 164 miles. Nevertheless he put my mind at ease when he told me that Sandringham was round the next bend; not quite! In fact it was another four miles before the most wonderful brown sign appeared telling me that I had just three more miles to do: piece of cake! It'd be fair to say that it was the longest three miles I've ever cycled, but I did it. Home safely, job done, even if it was elongated. At the finish the Leonard Cheshire team were there to meet riders with a round of applause, bedeck us with a finishers medal and thank us for our efforts. On hearing of my problems escaping Holt there was some suggestion that some signs had been removed by unscrupulous characters which, if true, would make me feel a little less inept; but who knows where the signs went? Once the bike was packed away in the car it was just a case of an hour's drive home whilst taking in as much liquid as possible. I had serious trouble trying to eat the sandwich and protein bar that I'd left in the cool box for the journey home. Once home and showered I sat down to a pasta meal that Chris, my wife, had prepared but I'm afraid I couldn't do it justice and struggled to get even halfway through it, which is unusual for me, but I certainly slept well that night. So what lessons, if any, have I learnt from my extended ride? Firstly I've learnt that the Precision Hydration drinks I had been trying on weekend rides works for me. I used their products, based on the results of my sweat test results, followed their suggested drinks programme and, except for running out of fluids, it worked well for me. Secondly, the review I read on Sportive.com that gave a big thumbs up for Veloforte energy bars was spot on the money. The bars are everything they claim to be and with my drinking regime, the Veloforte bars and the couple of extra bits I picked up at the feedstops I survived the ride, even though I was a bit jaded at the end of it all. But, most of all, I've learnt that I must learn 'Garmin'... Now, where's that idiot's guide?